Aufgrund der zahlreichen englischsprachigen Zuschriften zu meinem Blogeintrag, habe ich mich entschieden diesen nochmals in englischer Sprache zur Verfügung zu stellen. Auf Deutsch findet ihr den Eintrag hier. Photography is visual, that goes without saying! —, But what happens when we as photographers have the best photography equipment, but cannot see properly what our equipment delivers? Correct! Nothing! As a result, the output medium is key. The Retina display was reserved for Apple customers for a long time, but as time went on, Windows slowly released more and more Retina display-equipped devices. We now finally have 4K (also called UHD) for photographers and graphic artists to accompany the high-resolution cameras on the market. It almost goes without saying that I had to try it. So, I replaced my monitors at home with two brand-new EIZO CG248-4K monitors. 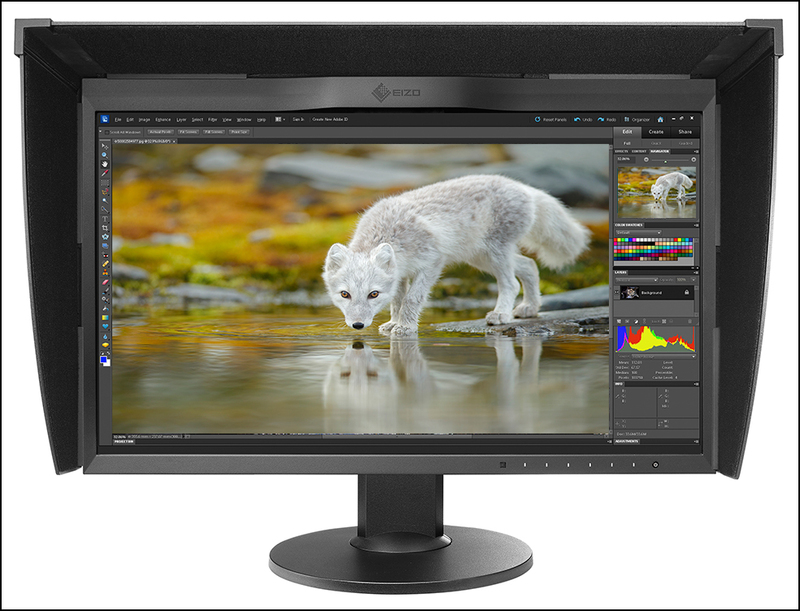 The EIZO CG248-4K is a 23.8-inch wide gamut LCD with LED technology. It resolves 3840 x 2160 pixels and thereby covers 93% of the DCI gamut and 99% of the Adobe RGB gamut. Thanks to 10-bit color reproduction, it offers special color precision, but WAIT! I don’t want to bore you with all of the technical data and color measurements. You can find that information in any technical magazine or on the information sheet. What I want to do is show you what a monitor like this offers me. I want to stick to practical matters and not delve into gamuts and the like in any great detail. The most inexpensive 24-inch UHD monitors on the Web currently begin at around €400. At €2,449, an EIZO CG248-4K costs almost six times that amount. Why? The topic of monitors often came up during my courses. The question that was asked was: Why does it make sense to purchase an expensive, hardware-calibratable monitor when you can calibrate a less expensive monitor with a colorimeter? You can imagine how to adapt the colors of an image in Photoshop using the gradation or the tone curve. That is, the incoming signal from the graphics board is adapted to the color interpretation of the monitor. The problem is that you quickly end up generating tonal breaks, among other things, but these are not available – only those generated by the monitor are, as the calibration software has to intervene too much. Another big advantage of an EIZO CG248-4K is the 16-bit look-up table, which ensures the monitor is free of tonal breaks. In addition, a monitor like this ensures even brightness distribution and unbelievable color purity. To achieve this, manufacturers go to great effort and expense, which is why monitors like this are more expensive. What’s more, most photographers nowadays almost exclusively view their photographs on a PC, meaning the monitor is the most important output medium. After all, that’s where you want to see what you have photographed, isn’t it? Technical perfection: The best graphics monitors currently on the market in my opinion. The EIZO CG248-4K comes perfectly packaged. The packaging is nondescript and fully serves its purpose. 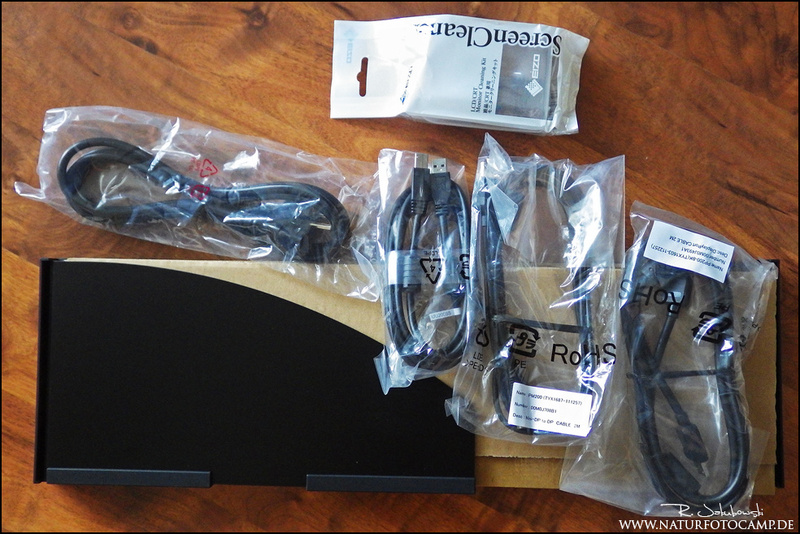 When you open the package, the first things you will find are the light hood included in the delivery and the required cables: USB, DisplayPort, Mini DisplayPort, and power. This is where you get your first pleasant surprise: A screen cleaning set is included in the delivery. It’s a small token, but it made it clear to me when I was unpacking that no expense was spared. Once you remove all of the polystyrene, you’ll get your first look at the monitor. It’s sleek, simple, very flat, and black. When you’re lifting it out of the box, you’ll immediately notice the 24-inch monitor weighs in at a heavy 8.5 kg. The process of cabling the monitor is very simple. 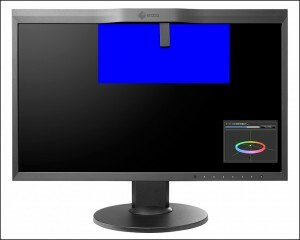 The EIZO monitor features a wide range of connection options, including two DisplayPort ports, two HDMI ports, and three USB 3.0 ports. This is sufficient for professional photographers and/or filmmakers. So far, so good, but here’s where we come up against our first problem. Until now, I have always operated my monitors via DVI and used a graphics board with two DVI ports accordingly. However, now I need a graphics board with two DisplayPort ports. Current graphics boards allow you to choose between one or three DisplayPort ports and a graphics board like this will cost you anything from €200–€250 upwards. Anyone want to know why I don’t rely on HDMI? HDMI only allows 4K monitors to operate with 30 Hz. Cables, light protection shields, and a screen cleaning set are all contained in the package. 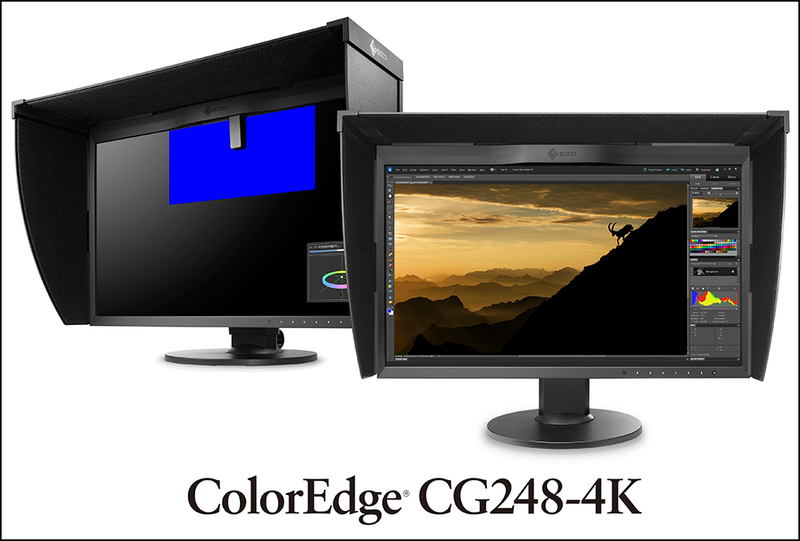 The new CG248-4K features more than enough ports. 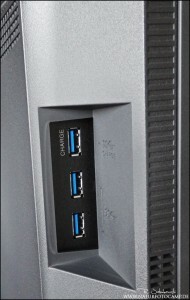 Three USP 3.0 ports on the left side of the monitor. EIZO monitors always remind me of ThinkPads: The design has been very similar for many years and you either like it or you don’t. 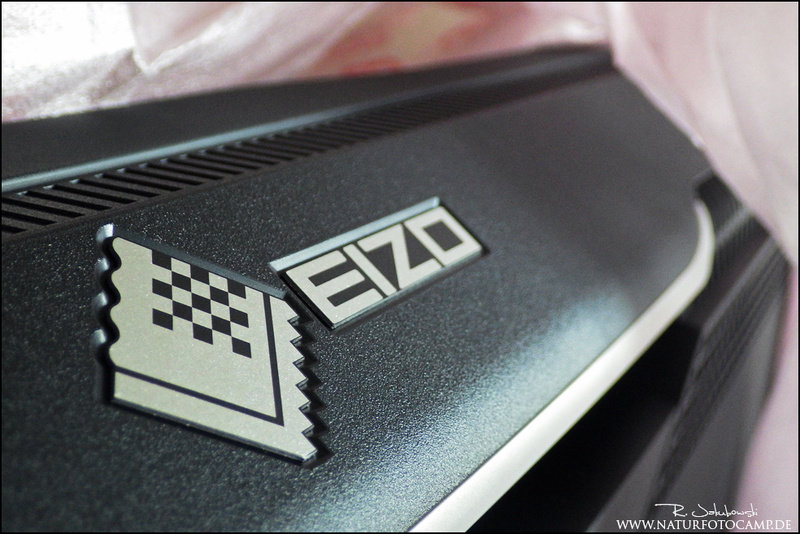 The EIZO CG248-4K’s design is no exception. The processing quality is excellent and the CG248-4K feels quite a bit thinner than my NEC Spectraview 241. 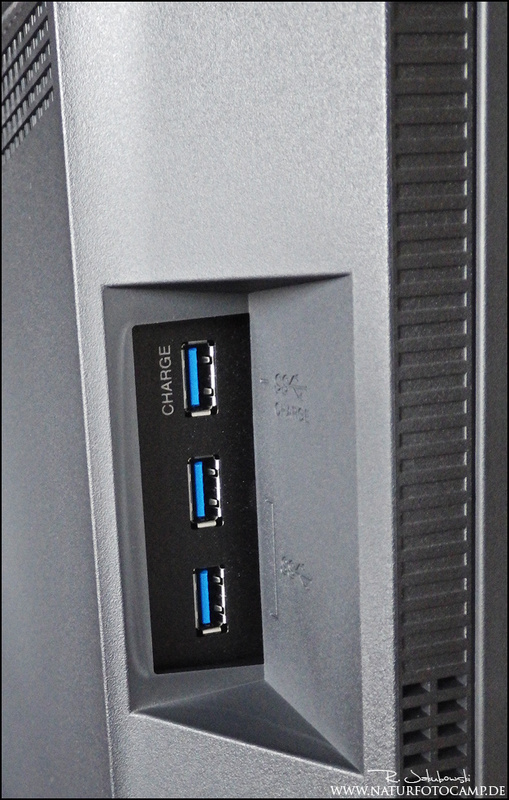 At this point, it’s positive to note that the USB hub supports USB 3.0. 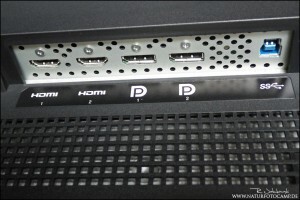 Those who do not have a sufficient number of front USB ports can connect hard disks directly to the monitor. The normal control buttons have given way to touch-sensitive, illuminated operating elements. It is very easy to operate and it is possible to switch the language to German, if necessary. The light protection shields provided are also self-explanatory. All you have to do is put them together and put them over the monitor. A graphics screen in this price range must have one thing: a built-in colorimeter. Gone are the days when you had to see how to attach your Spyder or which USB port you connect it to. The EIZO CG248-4K features a permanently installed colorimeter, which only has one disadvantage. It almost scared me to death when I was setting up. This was because the first time it starts, it immediately moves from the monitor to perform its duties. If you’re not used to this, it can come as quite a shock. Operating the colorimeter is very simple. All you have to do is install the ColorNavigator software provided and follow the instructions. It really does work superbly. Users have the option to specify that the monitor calibrates itself at a regular and specified interval, meaning you no longer have to think about calibration. I always hated fumbling around with an external colorimeter and as a result often neglected this process. That no longer happens to me now. One of the great things about the software is that you can create different profiles and change them very easily. Simply right-clicking the ColorNavigator software gives you the option to decide which color profile is enabled on which monitor. This is a really cool feature. This way, you can differentiate between your normal profile and the profile for printing. Those who want to go into more depth as far as calibration is concerned can do so with ColorNavigator software, but it is not mandatory. The built-in colorimeter, including software, can be seen here. Color profile selection under Windows 7 thanks to ColorNavigator. It’s very simple! Let’s get down to the most important question: What was my impression? AWESOME. The 4K is really something. You can almost touch the monitor with your nose and everything is still very sharp. The detail is magnificent. I’m blown away by the quality. At first I left an old monitor on my desk to see whether there was any real difference, and I really had a good time with this. You have to get used to it for the first two or three hours. It’s almost too sharp, but then it’s really great. The resolution of 3840×2160 pixels, or in other words, eight megapixels, is gigantic. You have to get used to the fact that that’s the resolution of a Canon EOS 1DIIN or 30D. As a result, opening the image is already a 100% view. At the same time, a 900 pixel Web version of an image is like a tiny thumbnail. In Photoshop, this results in the fact that you work more frequently in the 200% or 400% view with the ‘old’ 20 megapixel images. When compared to a non-4K monitor, you can recognize significantly more details in the images. I’m so impressed by the colors and the illumination of the panel, because they are identical on both monitors. I’ve NEVER managed to make the colors on the left and right monitors identical. The new EIZO CG248-4K does it with just a few clicks. I’m very impressed! The illumination is very even and the colors and contrasts are also top-notch, even from unfavorable viewing positions. Even the brightening of dark areas from a slanted direction is minimal. To make a long story short, the performance is absolutely perfect for my applications as a photographer. Honestly, many nature photographers spend thousands on super telephoto lenses and equipment and save money in the wrong place – the monitor. Let’s be honest, most of us just want to push a button and have everything work perfectly. This works flawlessly on the EIZO CG248-4K. It’s simple to operate and you don’t have to do a lot to achieve the perfect result. 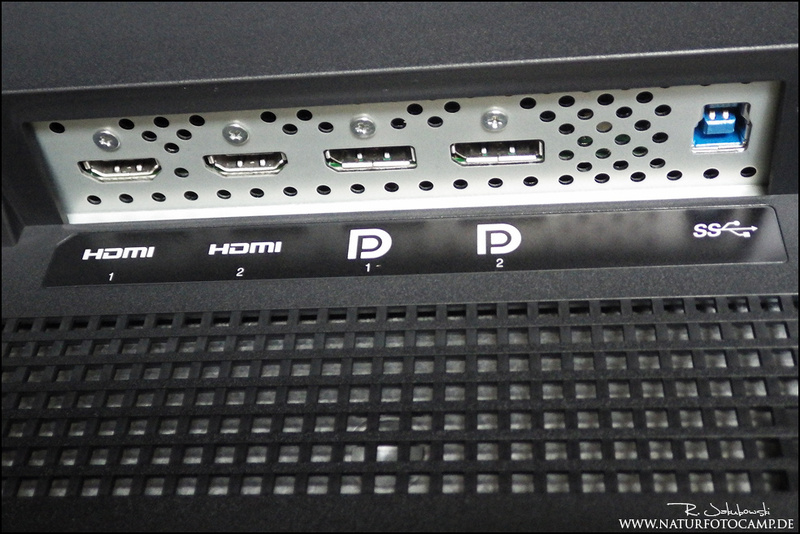 At the same time, the monitor and the supplied software contain all of the settings and ports in order to keep all of the options open for the most professional users. 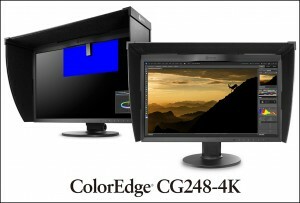 I’m convinced by the results and I really love working with the new CG248-4K from EIZO. Looks great on your desk. 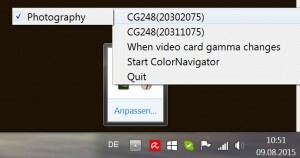 – Graphics board conversion is foolproof under Windows 7: Uninstall all drivers, connect the new graphics board, and install the current driver. – Windows 7 functions perfectly with the EIZO CG248-4K. Simply go to Control Panel > Appearance and Personalization > Display and increase readability to 150% or 200% and then you can see everything very clearly. – Photoshop CS6: I’m disappointed in Adobe again here. All Adobe CS6 versions (Photoshop, InDesign, etc.) do not support UHD/4K monitors, meaning the icons are very hard to read. It should be noted that Adobe later supplied these features for the CS6 versions for Apple, but not for Windows. It’s just another example that shows how NOT to do things, Adobe! However, I can reassure anyone who has already worked with Adobe CC that Adobe Photoshop CC can be scaled well on the EIZO and can then be read easily.